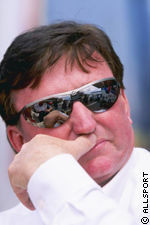 After years as a struggling independent driver, sharing a jar of peanut butter and a loaf of bread with his crew, Richard Childress retired as a driver and put Dale Earnhardt in his cars. It was a match made in heaven. Six NASCAR Winston Cup Series championships and millions in winnings followed Richard's difficult decision to hang up his helmet. It was a long way from the years between 1969 to 1981 when Childress drove his own NASCAR Winston Cup Series car. In it h e recorded six top-5 finishes and 76 top-10s. Since 1984, Earnhardt and Childress have won six titles, 62 races and more than $30 million. Another decision was made for 1997. The decision to follow a few other owners in cutting costs and increasing test dates by adding another team. Childress added Mike Skinner, creating one of the sports' most exciting stables. It didn't take long before his move proved to be an astute one: Skinner was the fastest qualifier for the 1997 Daytona 500. Childress' knowledge of cars, racing and business have put him on a short list of the top owners in the sport. With six NASCAR Winston Cup Series championships hanging on the wall of his North Carolina shop, some would assume Richard Childress Racing is running out of wall-space. But leave it to RCR -- if Earnhardt, or second-year teammate Skinner should win another championship, they'll just build another wall. Childress is married, and he and his wife Judy have a daughter and two grandchildren. He was awarded the Order of the Longleaf Pine by North Carolina governor Jim Hunt in 1994, the highest honor the state can bestow upon a citizen. He owns a ranch in Montana where he fishes and hunts. Nearly 20 great years of friendship and success! Statement from Richard Childress, President and CEO of Richard Childress Racing Enterprises, Inc. Words cannot express the tremendous loss all of us at Richard Childress Racing are feeling at this time. All of our thoughts and prayers and our deepest sympathies are with Martha, Teresa, Kerry, Kelley, Dale Jr., Taylor Nicole, and the entire Earnhardt family. Dale Earnhardt was much more than a race car driver. He was a very loving husband and a proud father and grandfather. He was a successful businessman. He was also a hero to millions of racing fans throughout the world. Dale was my friend. We hunted and raced together. We laughed and cried together. We were able to work side-by-side and have the success we had for almost 20 years because we were friends first. I will miss him always. He was the greatest.